Why, welcome back to my on-going catch-up with one of the most enjoyable series of books I’ve had the pleasure to sit down with (and miss bus/train stops) in a long while. 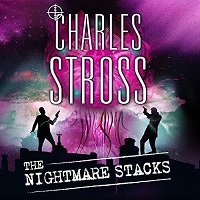 I’m talking about Charles Stross’ Laundry Files series, of course, of which The Nightmare Stacks is the 7th instalment. The 8th novel, The Delirium Brief, came ouit in July, so you could say that I’ve caught up! The Laundry Files follows the fortunes (and, quite frequently, misfortunes) of a number of protagonists working for a secret and secretive Government Agency dealing with what we call the Occult - essentially MI5 for tentacled horrors from other dimensions (I simplify, a lot, as you will see below). Essentially, though - magic is real (it’s a branch of applied mathematics), and so are a lot of the mythological creatures and concepts going round, and someone had to keep a lid both on things which go thump in the night (and might terminally affect humanity, never mind the UK), and on people with a mathematical or programming (closely related in many cases) mindset who might just independently trip over some of the crucial theorems and algorithms (aka invocations…) which might do them, and us, much harm. This is, though, mixed in with a good amount of geeky jokes, irreverent discourses on the horrors of Bureaucracy and Politics, never mind Office Politics and Paperclip Audits; as well as peppered with references to other genres, writing styles, and societal structures. In short - it’s much more fun than simply something which crosses what is essentially Horror with a Secret Service Agent setting. Charles Stross is a professional writer, now mainly of Science Fiction but previously also of Computer Science and whatever paid the rent for a freelance journalist. He’s a hugely entertaining presence, should you have a chance to see him speak on stage, or in a Bar at a SF Convention. He lives in Scotland, but was born and raised in Leeds, which, telling from the story at hand, he does not have a great relationship with! He has won multiple awards for his stories and books, and shows, thankfully, no sign of slowing down. Now, but what about the story? Well, firstly, it’s a departure, inasmuch as it’s Dr Alex Schwartz, PhD, who is the protagonist relating the story. Ales is one of the surviving Vampires from the secret cell of Quantitative Analyst at the Merchant Bank, now working for the Laundry, because the alternative is, well, not much of one, really. He’s not very taken with his condition, either, regardless of the abilities it confers him - he compares it to coming down with the magical equivalent of AIDS, whilst jealously looking at the cool kids in Lycra from The Annihilation Score. It’s also a detour, in some ways - whilst the previous few books plotted a path towards what will quite likely be the end of the World (known as Case Nightmare Green in the Laundry - essentially the walls between realities become too thin, and the tentacled monsters/Elder Gods awaken. Good luck.) this one shows a different, also possibly terminal scenario, known as Case Nightmare Red. Which is an unfriendly incursion from a parallel dimension, which in the case at hand turns out to be Elves. Now, don’t go and assume these are the friendly woodland creatures of the cutified, lobotomised lore, or Tolkien’s noble races, oh no. These are creatures, looking a lot like us, but having evolved magic before speech. They live in a magic-controlled, absolute, totally hierarchical structure where one fits in, follows the orders given, or dies. They have magic weapons, dragons with a really messed up corrosive body chemistry captured from yet another reality, Basilisks that can take down airliners; they ride Unicorns (have you read Equoid? Else you should…) and they can travel between realities. They also are desperate - they have invoked their own version of Case Nightmare Green, and what is heading our way is the final army that’s left - it’s take over our world (which they’ve seen before, and considered us below their worth at the time) or die. Good luck, humanity. So, the All-Highest of the Host of Air and Darkness, which is all that is left of the Morningstar Empire, has given up on trying to hibernate past the end of the world (because they are out of everything they’d need to continue doing so) and has decided to go the only way left for them. He has sent his daughter, the Most Honorable Agent First, Doyenne of Spies and Leader of Liars ahead as a scout. Who has entered our world through a portal they opened, and has taken over what she considered a suitable host - memories, look, life - and is collecting information on how our world is organised and defended, and how to best take it over as the Morningstar Empire’s new home. With all of us as expendable slaves, inasmuch if still alive, of course. Enter Cassiopeia ‘Cassie’ Brewer, a drama student at Leeds Beckett University. And maybe not the perfect choice for what Agent First would have needed, with hindsight - which she’ll only gain once she gets over her rather severe culture shock. Because, what she’s looking at is a clash between a massively hierarchical magical non-technological civilisation (High Fantasy, anyone?) with our technology based, laissez-faire mess of an unstructured (by comparison) anthill. The setting is marvellous in its imbalance, even if it reeks of ‘I’ve done Zombies, Unicorns, Vampires, what next? Oh, I know, Elves!’. The book is, like the rest of the series, seriously entertaining and engrossing. But, having said that, there were indeed a number of areas which I felt were less than perfect, or maybe just not worked out enough? I actually felt that quite some of the book could do with some more balancing and cleaning up, FWIW. The format, as several times before, is again as (nominally) a work diary, written by Alex with the aim to retain organisational knowledge in case of loss of the agent in question, although a lot of it claims to have been written post-events, thus rendering this justification void. Also, it departs from the format much more than earlier books, inasmuch as there is quite a lot of other materials interspersing Alex’ viewpoint - we see meetings by his betters, we see what happens with Cassie and the Morningstar Empire, we see Cassie’s inner life, and we see a number of flash-backs to earlier behind-the-scenes events which shed light on the game that’s being played. The final sequence smacks of Flash Gordon, and the books stops too early in my opinion, and with too many open threads - this needs at least a decently-sized Epilogue. Not a bad book by any stretch of the definition, but to me the weakest book, in execution, of the series so far. Let’s hope the next one picks up the slack a bit!